Heck this way you dont have to dig them out of a wire way when you want to change them!!!! ...Let alone adding a new toy!!!!!!! Holy Crap ! That is a lot of Radios . So are you in charge of all Landing and Take Offs for the entire Eastern seaboard Air system or just your State ??? I have a few friends that still have their original rigs for posterity sake. As for me, I've only been in this thing for two years, and at 62 I'm not into keeping around more crap than I can use. I've been swapping, buying and selling to get to where I'll have three modern rigs once the QRP rig gets here today, and that should hold me over for the winter. As far as antennas go, that's another story. Its so much fun to build them, tune them and then talk to someone in Europe, South America or Australia, that I'll probably just keep doing it. Yesterday I bought a 2000# 12vDC winch for raising and lowering my tower so I can do it by myself. I have a 10m vertical antenna that needs to come off the mast, and a rotor that needs mounting for my 8-element dual band cubicle quad UHF/VHF antenna. I need to figure out a mounting spot so I can get those projects done before the snow. A friend of mine is going to show me how to work the digital modes this afternoon. I've played with PSK31 a little, but there's so much more out there to learn about that a little coaching will shorten that curve. 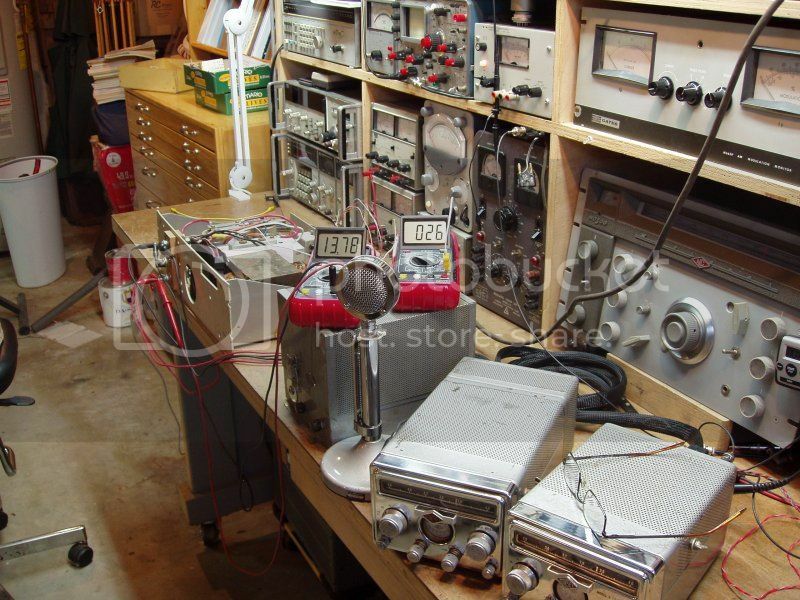 Getting back into ham radio is not too hard. The biggest thing for HF is getting a wire out the window to talk on. Living where you do, it's not like you're going to piss off any neighbors on that dirt road with a few antennas strung up in the trees or off a tower. A G5RV is all you need and you're back in business. Ok .. I was right there with you on understanding everything you said up to the part "The problem is". After that ,every thing got fuzzy ,but I think I may be ok . The nurse has set up a IV drip of Rum and Dr.Pepper. Have run G-5s off and on .....out in western KS...I put up a phase rotated 80 meter vertical...3 elements each way......had a lot of fun with that.....plans can be found in some of the old hand books and qst had an artical on one years ago.....I used to work phone patches for guys stationed at the north and south poles...talk about a phone bill!!!!!! Some of the guys hadent been home for a long time and I couldnt find it in my self to cut them off....Mom came in the shak one night and said ...we cant stand the bill this month as it ..........I ask her if she remembered when I would call home from Guam and nam?.......I got a yes........said theres the button hit it.....she just shok her head and walked out........it always got paid.....Now days with cell phones and internet ect...I would bet a lot of new hams have never had a phone patch or even know how to work one!!!!! Where Im at now it is going to take some tower....as Im down in a hole with a lot of trees around me.....That was suposed to be the first thing we did before any remodling or anything!!!!! !yea right!!!! any way I have been looking at some tree tops as of late!!!!! I was always thankful for the hams that phone patched me home when I was stationed in Turkey back from '70-'72. My roommate had a friend in Germany who would make the connection stateside. I never knew that someone was eating the phone bill so I could talk to my family, I was just thrilled to be able to talk to my wife. The Phone bills were just part of it.....when I was over seas I would hook up with a fellow ham right there in town and he would holler at mom and she would just go over there. to his shak....then when I was home it depended where the call went from my shak as to the cost..Many times due to the military thing the familys were eather on the east or west coast.....but I dont regret one penny.....and would hate to have people know how many times I sat there running the patch and balling my eyes out right along with them......they couldnt hear me but I had to hear them so I could switch T/R modes....and unless they ask me a question I kept my mike dead...cause the girls would come in and out.......any way the rules said you could axcept no compensation what so ever in conection with the hamming!! !not even phone bills. Hay by the way ...Nice little rig there!!!!!! This is my solution to cable control. I just put the benches on caster wheels so I can move them away from the wall. Holy crap Batman! that's a pretty bad Jones you have there Mike. Great idea on the rolling benches for rear access. For me it's too late, as I have a finished room with fixed work surfaces that I operate from. BTW, I wish I would have kept my D104 instead of selling it with my TenTec Omni D. I miss having sitting on the bench. Takes me back to my CB days in the early 70's when we could get them right from Astatic down the road. Today I operate HF with a Heil boomset with the HC-4 element and a foot switch. Keeps my hands free and my voice never changes as the boomset is always in the same place when I turn my head. Question...do you actually get time to play with your toys? Edit: I zoomed in to see what equipment you had, and noticed the D-104 head on the boom. Neat idea! all I did last week for "cable management " was pull a few cables for a new phone patch up at a local tower. I don't operate a lot but I do join in on the MOKAN 80 meter AM net every morning. You can buy 104's on ebay all the time for fifteen to twenty bucks. I got tired of pushing the thing around so I bought another and put the head on that old desk lamp arm. I just talked to Bob Heil this morning he is on the MOKAN net fairly often when he's in town, a genuinely nice guy. 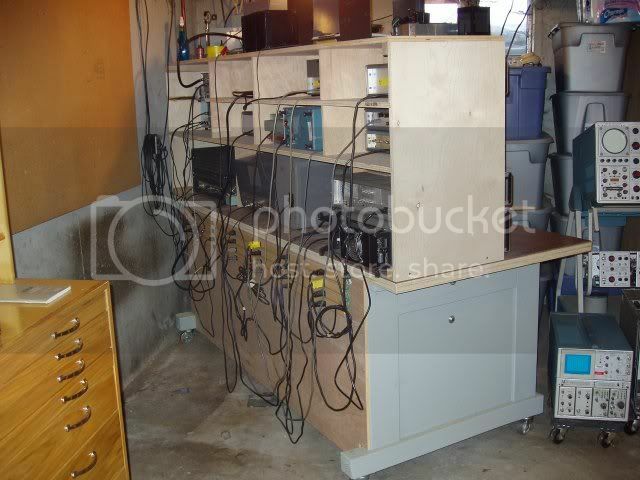 I always have a project going, and rite now its a set of power supplies that will allow me to run just about any Military gear that might come along. Mind you I'm not a real "Military" affectionado, but there are a few that are fun to operate. 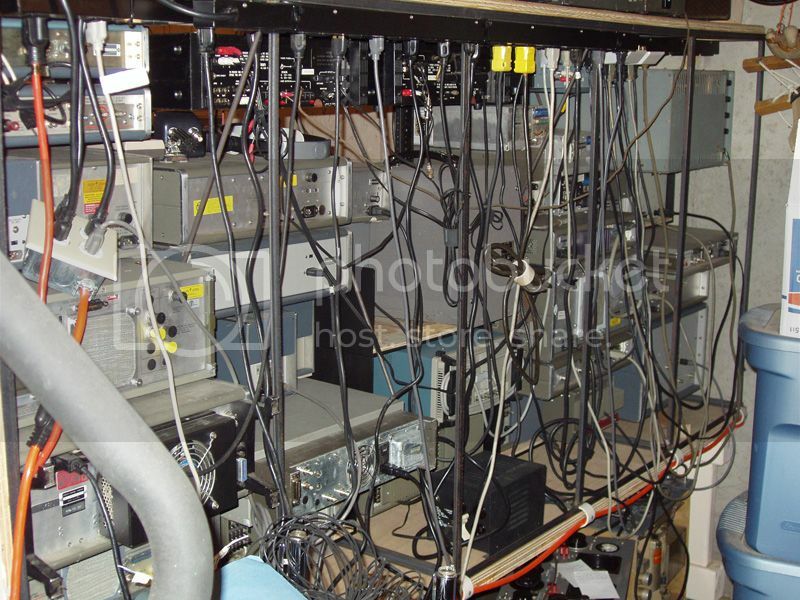 The reason for the New Bench was to avoid this kind of mess on the radio operating table. Woodworking is another money pit so making what I want is a lot easier. Last edited by Mikeinkcmo; 01-08-2014 at 10:51 PM. 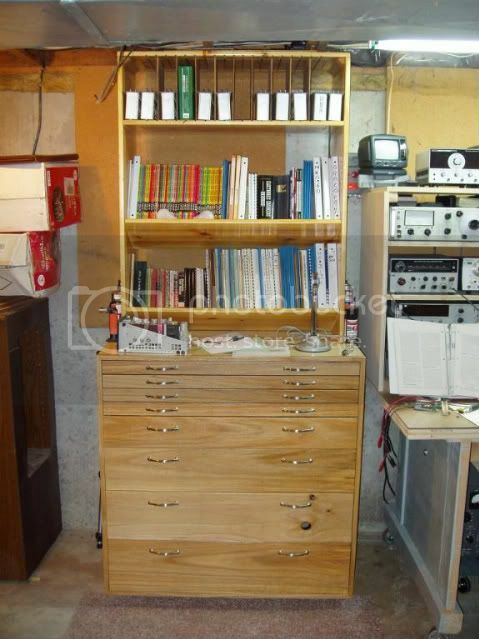 Is that a stack of drawing file drawers I see in the picture? I was a machine design engineer for 12 years before giving up the office for my construction business, and I filled many a drawer with drawings in that time, before teaching myself AutoCAD and going into architectural design for residential and industrial buildings. Don't know why I ever went to college for something I really never wanted to do. Guess I was living up to my father's expectations, not mine. I like being hands on and being outside, not cooped up in an office. Don't regret leaving the office or the stress headaches it gave me. Actually its a parts cabinet I built several years ago. These pics were taken rite after I built it, and they are getting a pretty crowded now days, so I may need to make another one. I definitely need more book shelves. I must admit I was influenced by the flat files I have for tool boxes. I purchased a couple large ones with several drawers a few years ago and use them for tool boxes. Nice big ball bearing drawers and so big you can't buy enough tools to fill em up.